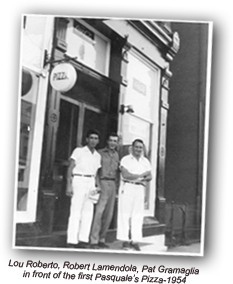 In 1953, when Pat and Vince Gramaglia and cousin Lou Roberto decided to pull their money, talents and energy to create a great pizza restaurant, pizza was new to America. And who better to introduce it to the Cincinnati - Kentucky area than three local Italian cousins? Their main focus was to perfect the product, especially the signature sauce, which is the same sauce you get today. Pat was not new to the food industry. He loved to cook and was a cafeteria chef for a large manufacturing company in Cincinnati. Vince was a baker and he worked tirelessly to create pizza dough that was both thin and flavorful. Lou had the entrepreneurial spirit, drive and ambition to manage and run the restaurant. They all loved to eat. The three of them researched, cooked, and tasted recipes until they had a menu of unique and delicious pizzas and sandwiches, including the famous Stromboli Steak sandwich. In 1954, the first Pasquale’s Pizza opened on Queen City Ave.with great success. By 1957, Lou Roberto knew he loved the pizza business and wanted to have his own location. He purchased the very first Pasquale’s Pizza franchise. The rest of the story is a part of Pasquale’s and Newport’s history! Lou was the original pizza man. Owning and operating his restaurant was his passion. He loved being a part of the Newport community and having his family involved in the pizza business. Pasquale’s Newport has always been a family affair. Between 1974 and 1978, Lou’s sons, Tony and Vince, both began working at the Newport location. It soon became a full time job for both sons. Although Tony passed away in 1988 at the age of 32, Vince continued to make pizzas side-by-side with his father. Ten years later, Vince brought his son Vincent to work part-time and learn the business. Lou remained an active part of the business until he passed away in 2000. Vincent, having been mentored by both his dad and his grandpa, started to show an interest in the family business and in 2001, it became a full-time job for him as well. Today Vince and Vincent still work together at the Monmouth Street location, and you can get the same authentic pizza with the signature sauce, the world famous Stromboli steak sandwich and dozens of other delicious menu items. Order today and see why, for three generations, our customers keep coming back. Prices and menu subject to change without notice. © Pasquale’s Pizza • Site design and images 411 Graphics. All rights reserved.